In this week’s episode, we are bringing the boundary conversation a little closer to home. 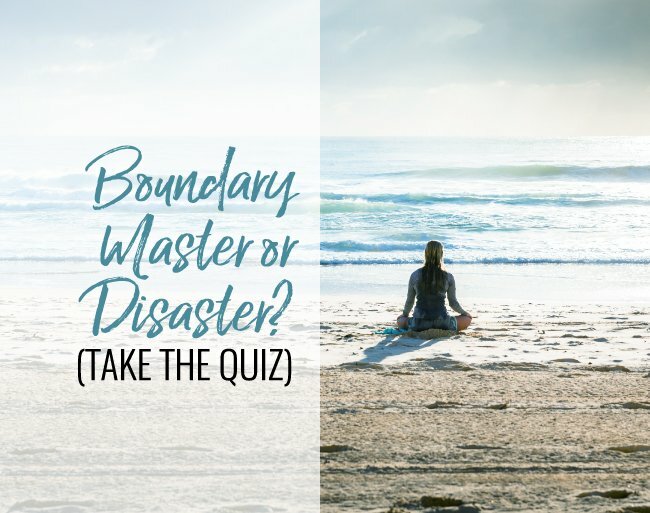 So let me start with a question: Are you a Boundary Master or Disaster? When you think about drawing boundaries, what comes to mind? Do you feel anxious or stressed? Do you feel confident and solid? Are you clear about what the question specifically means? If you are unclear, fear not you’ll have an opportunity to download the boundary quiz I created to give you some insights into your unique boundary situation. Let’s start with why the topic of boundaries can be so confusing. Part of the reason is that there are multiple categories of boundaries and each person has their own boundary style, influences, and beliefs. It isn’t just having the ability to say no when you want to say no. There are many other aspects of drawing boundaries and to become a true boundary master, you need to understand what they are, where you’re applying them, and how you learned them. The family you grew up in, also known as your family of origin, has everything to do with how you relate to boundaries. All families have their own culture, norms, and expectations when it comes to boundaries. How your parents or caregivers related to boundaries created is what you learned and all families are unique. The good news is that knowledge truly is power and if what you learned (or didn’t learn) about boundaries is negatively impacting the quality of your life and relationships- you have the power to change it. Let’s look at the types of boundaries. There are material, physical, mental and emotional boundaries. Physical boundaries include personal space, how you liked to be touched physically and sexual boundaries. This includes how quickly or slowly you become sexual in a relationship. Material boundaries pertain to your stuff and in some definitions your time. Do you like to lend your things to others or not? Do you limit the amount of favors you will do for friends or acquaintances to protect your personal time or do you feel taken advantage of instead of setting a limit? Mental boundaries cover your thoughts, values, opinions, and beliefs. When you are in a group of people who have a different opinion than yours can you stand firm in what you think or just agree to keep the peace? Emotional boundaries are the ability to distinguish where “you end and I begin,” as boundary expert and author Anne Katherine put it. This can be especially challenging for people suffering from codependency. Understanding that your happiness is your responsibility and not taking on the emotional baggage of others is an indication of healthy emotional boundaries. Have you ever experienced a Boundary-less hangover? This is the experience of oversharing your deepest darkest life secrets on a first date or to a new pal on a girl’s night out and waking up to feelings of regret, embarrassment or humiliation. This is an example of weak emotional boundaries even if weakened temporarily by too much tequila- the end result of feeling too exposed too soon is the same. Real intimacy takes time to build. Personal stories and private information shared naturally over time to people who’ve proven themselves trustworthy is evidence of healthy emotional boundaries and a solid foundation for enduring connections. Why is being a boundary master important? Contrary to popular, fear-based beliefs boundaries actually protect the relationships you hold dear. Clear and transparent expression of your expectations, limits, desires and deal breakers set up the relationships in your life to succeed. Most of us are not taught this vital skill set so we are left to figure it out on our own with bad information and faulty role models. Think about your life right now…do you have any relationships where you feel perpetually frustrated, taken advantage of or misunderstood? This is most likely due to unhealthy boundaries and a limited ability to clearly articulate your needs, desires, and preferences. The remedy to just tell the truth may sound simple yet is anything but. In this episode, I am providing you with the opportunity to gain clarity on your relationship to boundaries because you cannot change what you are not consciously aware of. Taking the Boundary Quiz will give you a snapshot of your boundary skill level, right now. This is the starting point for change and will provide a behavioral baseline. So I hope that you found this episode helpful and if you did, please share it on your social media platforms. As you know, we’re in Boundary Bootcamp season so please join me for a deeper dive into understanding your quiz results and more info on how to become a on this week’s Wednesday Wisdom livestream at 3pm EST on my Facebook business page, which is Terri Cole, LCSW, and in my all female FB group, which is called Real Love Revolution. Thank you so much for watching, listening and sharing. Have an amazing week and as always, take care of you.